This is a book-plate for the Oswestry High School for Girls it is from a book of Sir Walter Scott’s poetry, published 1904. 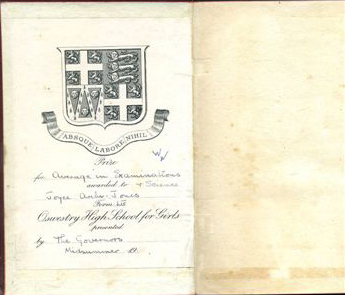 The prize is for “Average in examinations”, & written underneath is “& Science.” Awarded to Joyce Archer- Jones, Form LIV Oswestry High School for Girls presented by “The Governors. Midsummer 19…. the last 2 letters of the year appear to have been erased, as the paper has a tiny rough patch in its place !! This was sent to us by Geraldine Barnes-Lawrence gen@gblbooks.co.uk. We as a genealogy group are happy to collect any random bits of information that you may have and the following research stemmed from an item Geraldine Barnes-Lawrence, who is a book seller, emailed to us. The photograph she sent us was of a book-plate found inside a copy of Sir Walter Scott’s poetry, published in 1904. The book was a prize for “Average in examinations & Science” and was awarded to Joyce Archer Jones, Form LIV Oswestry High School for Girls. It was presented by “The Governors in the Midsummer term of 19…. the last 2 numbers of the year appear to have been erased, as the paper has a tiny rough patch in its place !! So I thought I would do a little digging into her family. We found Joyce Glascott Archer Jones’ marriage to John Bradshaw on 27th December 1945. Our local paper, Oswestry Border Advertizer on 2nd January 1946 had printed a photograph and an article about the wedding. This amount of detail is wonderful for anyone researching their family as it mentions a cousin who played the organ, a niece and a cousin who were bridesmaids, also a best man, apart from of course parents, their place of residence and the attending Vicar, who in this instance was Rev N S Baden Powell. I was then able to find Joyce, aged 4 with an older sister Kathleen, aged 5 and a brother Eric aged 1, with their parents Thomas & Kate on the 1911 census. Having a surname of Jones is usually a problem, but Joyce is a slightly unusual name and her father’s profession of a clothing outfitter and dealer helped and they were living in Chirk, Denbighshire, where most of the children are born, although Thomas was born in St. Martin’s, Shropshire. Very helpfully, living with them, was a Cissie ARCHER, who was Kate’s sister, which, therefore, gives us Kate’s maiden name. As the 1911 census gives how many years the couple have been married, which was 7, that takes me back to 1904 and I found on f http://freebmd.org.uk/ Katie Evangelyne M ARCHER marrying a Thomas JONES in July-Sept 1904. Another bonus with the Freebmd website, after 1911, is that it gives the mother’s maiden name and that allowed me to find Joyce’s siblings, Hazel E A born March 1912 and Sheila in September 1914. On the 1891 census Thomas JONES’ family are living 1 Queens Square, Chirk, he was an apprentice tailor, with brothers Charles, Peter and Archie and sisters Mary and Ada, along with their parents William and Catherine, who were are also tailors. William was born in Chirk, but Catherine was born in Liverpool. On the 1881 census, William and Catherine are living in Liverpool and have 2 more daughters, Clara and Anne and 2 sons William and George. We noted that Clara was born in Liverpool, but all the other children were born in St. Martin’s, Shropshire. There was going to be a good chance that William & Catherine may have married in Liverpool and that William may also have done his apprenticeship in Liverpool. On the 1871 census the family were living in Weston Rhyn with Clara, William and baby Elizabeth, who doesn’t appear on the 1881 census. On the 1861 census, William is a boarder, apprentice tailor, living in Liverpool. We found a marriage for a William Jones, a tailor, son of Peter, a collier, marrying Catherine Preston in November 1866 in Liverpool. This has been confirmed as the correct marriage with Family Trees on Ancestry.co.uk, plus there is a probable christening of William, in Chirk in 1843 to a Peter & Elizabeth Jones.